A 60-mile-long traffic jam on a major Beijing highway's entered day nine, with stranded drivers taking to playing chess on their cars as local vendors organize roadside shops like in a Cortázar short story. What's causing this potentially month-long jam? In short, increased traffic on the highway mixed with maintenance and construction. Britain's Sky News reported the snarls have been commonplace since May as a result of a spike in the number of trucks using the roads, with the daily peak reaching about 17,000. 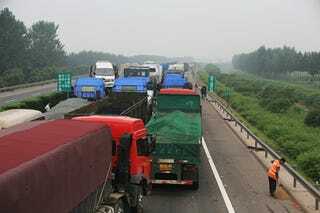 In this specific case, cars and trucks have been piling up since August 14 on the National Expressway 100, which is also known as the G110, the major route from Beijing to Zhangjiakou. Officials expect the congestion to continue until workers complete construction projects on September 13, the report said. Good luck to all sitting in standstill!